It is estimated that one in four students in United States schools may have a chronic health condition (Jackson, Vann, Kotch, Pahel, & Lee, 2011; Van Cleave, Gortmaker, & Perrin, 2010). 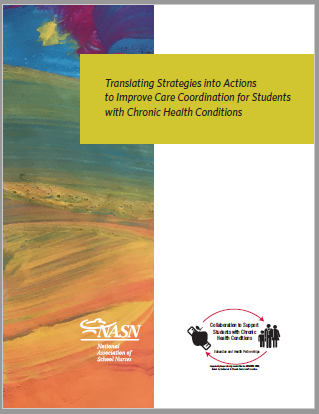 Approximately 6% of those students have multiple chronic conditions leading to challenges with treatment adherence, disease acceptance, lifestyle modification, care coordination, increased exposure to chronic condition risk factors, and difficulties transitioning to adult healthcare settings (Anderson, 2010; Rezaee & Pollock, 2015). Children with chronic conditions are at risk for high absentee rates, low student engagement, dropping-out of school, exposure to bullying, disruptive behaviors, poor grades, and below-average performance on standardized achievement tests (Forrest, Bevans, Riley, Crespo, & Louis, 2011; Bethell et al., 2012). The school nurse is well positioned to support the health and academic success of students with chronic health conditions by providing direct care and facilitating the many practice components of care coordination (Bargeron et al., 2015; Brook et al., 2015; NASN 2015). School nurse advocacy helps students and families to access needed resources in support of academic achievement (CDC, 2017). School nurses are leaders who provide care coordination, health education and promotion, quality improvement, and critical thinking skills that benefit schools, families, the healthcare system, and most importantly children with chronic health conditions. The key resources here support the school nurse leadership role in building school communities through collaboration with state and local health and education leaders. Advancing the leadership role of school nurses optimizes the health and learning of students with chronic health conditions. Please share your feedback using the comment area below. You may also contact NASN's Director of Nursing Education Nichole Bobo at nbobo@nasn.org. Click on a section to reveal resources. This online resource is supported in part by Cooperative Agreement Number, DP16-1601 NU1ADP003090, funded by the Centers for Disease Control and Prevention. The views expressed in written conference materials or publications and by speakers and moderators do not necessarily reflect the official policies of the Department of Health and Human Services, nor does the mention of trade names, commercial practices, organizations imply endorsement by the U.S. Government.